I had this idea about getting the kids out to a lake to swim and getting away from the heat. 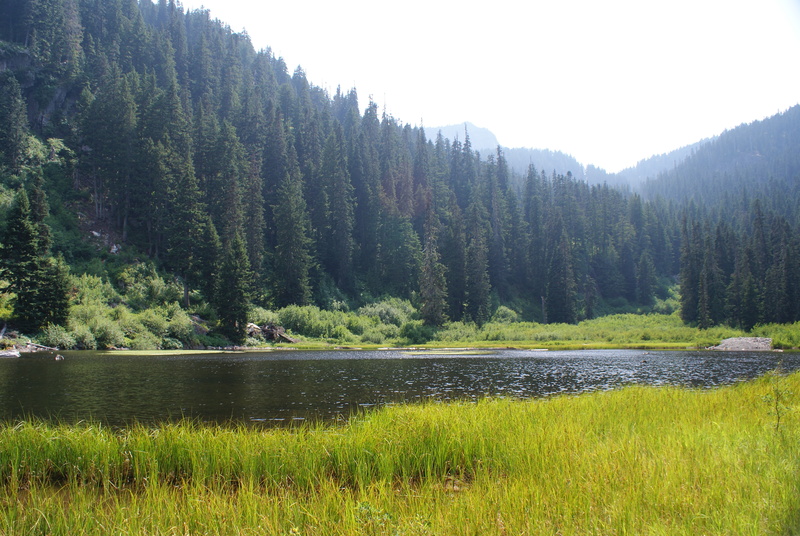 I remembered a hike we did several years ago, to Twin Lakes (actually, it’s only one lake…), and thought we’d give it a try. We found the trailhead with little trouble, though the road signs seem to be missing along the way. (The directions in the Day Hiking Snoqualmie Region for Silver and Tinkham peaks are adequate, though I thought they were confusing at the point where one enters the Hyak Estates.) My scariest moment, though, was when I met a fully loaded logging truck coming down toward me. I backed up off to the side to where I hoped there was enough room to let it pass, and tried not to fall into the ditch. Luckily, we made it through, but just take care as you go up the road, and keep your eyes open for wide spots to take refuge if you need to. Once we passed the active logging zone, the road was fine, just washboarded in places. Keep your eyes open for the trailhead off to the left, at a wide spot at a hairpin turn. Trailhead sign, off to the left in the bushes. There is plenty of room for several cars to park on the side here. 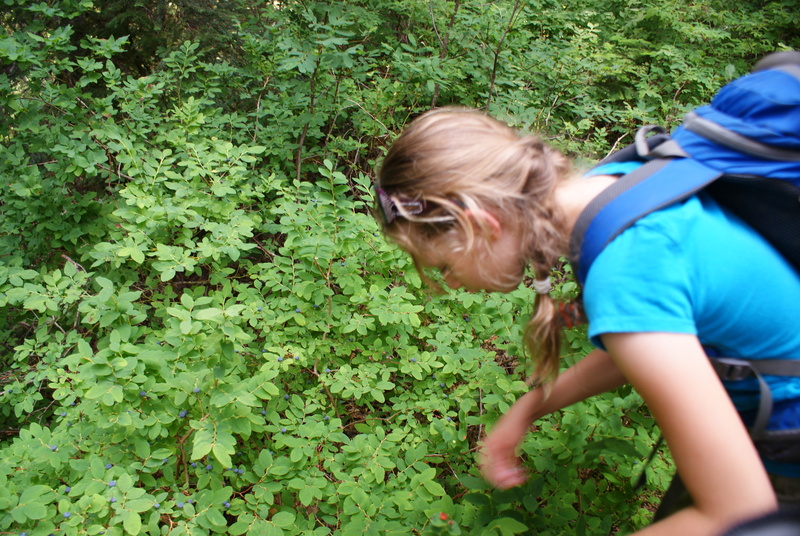 The trail takes off through pretty mixed conifer forest, with an abundance of huckleberry shrubs in the understory. Most of the flowers were done blooming; the berries were ripe for us, though, and caused some delay in our progress. The trail climbs gently over rocks and roots as it makes its way into the lake basin. Children will be fine, though toddlers and preschoolers may need some help getting up or down some of the rocks. 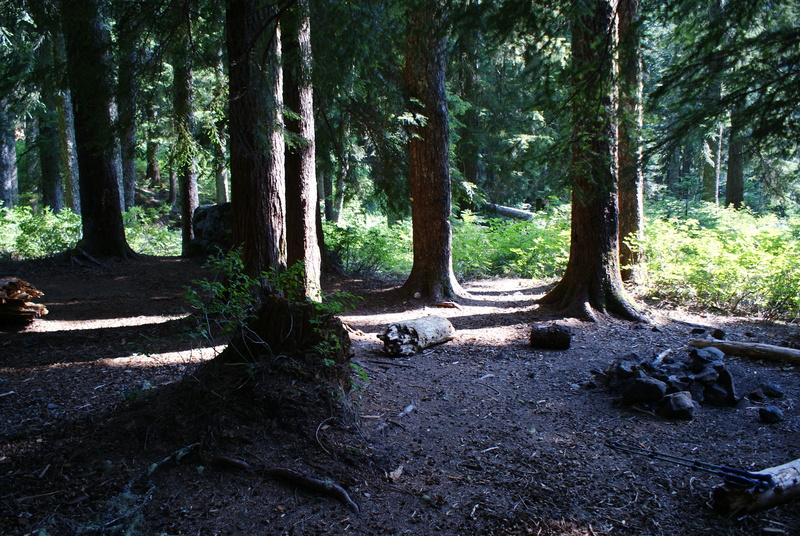 When we were almost to the lake, we saw a shady and roomy campsite that looked good for an overnighter with youngsters; it even had a fire ring for those times when fires are allowed (make sure you know current regulations; backcountry fires are banned most summers). The lake looks inviting once you break out of the trees. It’s shallow and rocky on the edges, with grasses and shrubs growing around it. Silver Peak towers above. The kids changed into swimsuits, and tried out the water. It was warm, but much of the lake bottom was silty and unpleasant. 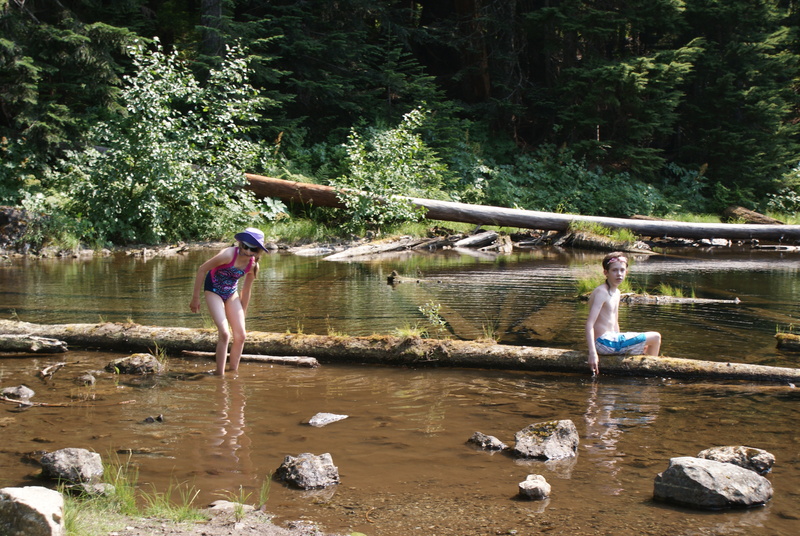 They still managed to enjoy playing in the water, and chased water striders and looked for crawdads. I poked around the edges of the lake, and startled a spotted sandpiper, which gave a frantic alarm call. We heard a constant serenade from Swainson’s thrushes, varied thrushes, and Pacific wrens. A crow washed itself in the shallow water at the far side of the lake. 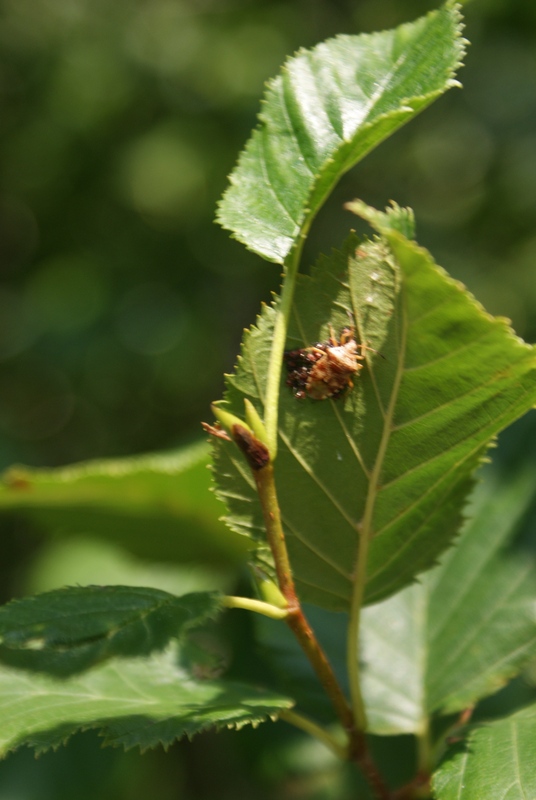 Gabe found a bug that was sheltering multiple tiny baby bugs on a leaf. It was sunny and hot, with little shade on the shore, and the black flies were annoying. Horse flies and bees were out, too, but were less obnoxious. It was peaceful and quiet, with no noise from the freeway or the logging area. We had some snacks, tanked up on water, and then rested in the shade back at the campsite before heading back home. It was 84 degrees at the car when we returned. We had gone through almost all our water, so I’m glad we had extra in a cooler in the car; ice cold to cool us down. 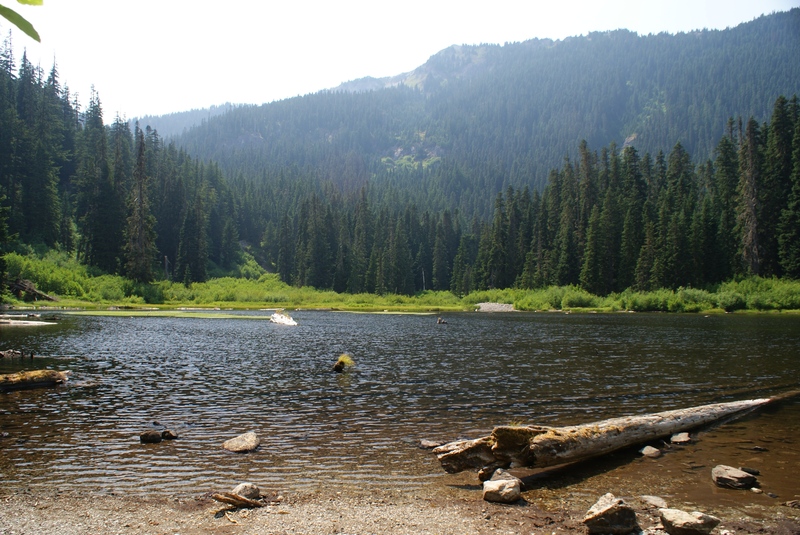 We enjoyed our short hike, but I think we all agree that the search is still on for the perfect swimming lake for hot days. If You Go: This trail is 2 miles round trip, with 100 feet elevation gain. 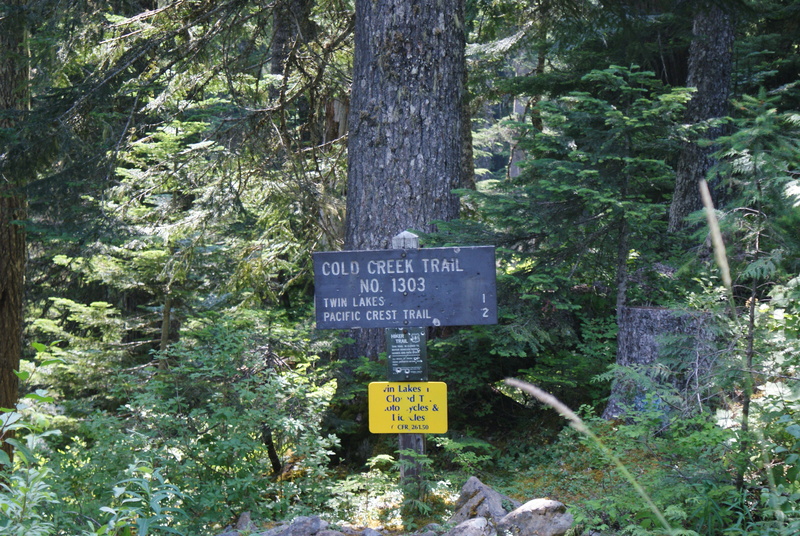 The Twin Lakes/Cold Creek Trail #1303 is accessed off Forest Road 9070. From Seattle on I90, take the Hyak exit just east of Snoqualmie Pass, and turn right at the stop sign. Go straight at the next stop sign, into Hyak Estates. Follow the main paved road as it turns gently to the left, then curves right at the big green building signed Hyak Joint Use Facility. After half a block, the road turns left again, passes what looks like wastewater treatment ponds, and then turns into a one lane gravel road. Follow this road for approximately 3.5 miles; don’t take any of the branches. Where it makes a sharp turn to the right, look left and find the trailhead sign in the bushes. Park on the side of the road, well out of the way of traffic. You won’t need any parking passes for this hike. No toilets are here; use the public restrooms at Snoqualmie summit if you need them before driving up the road.